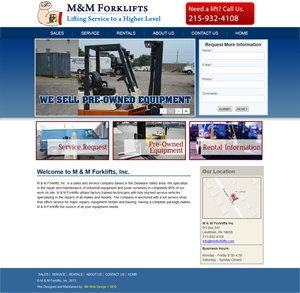 M & M Forklifts, Inc.
M & M Forklifts, Inc. is a sales and service company based in the Delaware Valley area. We specialize in the repair and maintenance of industrial equipment. After careful analysis and research, we moved forward with a web site that has been built from the ground up, in an effort to remain consistent with today’s Internet technology. 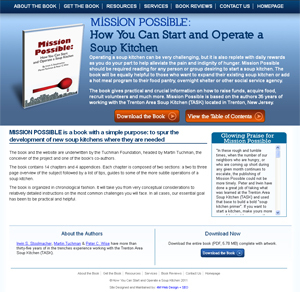 The user interface is easy to navigate and any information is no more than two clicks away. We designed a prominent “Download Now” button, which we placed on every page. The homepage also offers a scrolling "Glowing Praises" section. 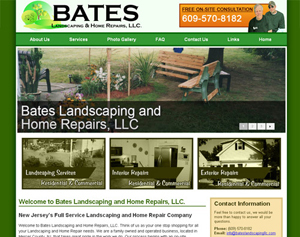 Bates Landscaping and Home Repairs is a family owned and operated business, located in Mercer County, NJ. We created a website site that reflects the same high quality and attention to excellence and allows them to connect with new customers by establishing an internet presence. 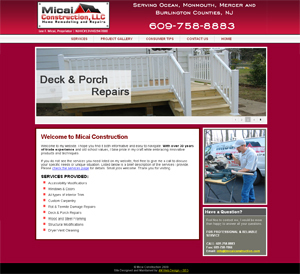 The clean and professional website offers a crisp color scheme, straight-forward navigation and three well designed call-to-actions on the homepage that allow visitors clear-cut access to all three of their services; Landscaping, Interior Repairs and Exterior Repairs. Inside the site we developed a lightbox photo gallery of all past projects and a contact form. 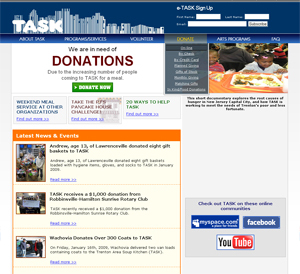 Other internal pages include: About Us, FAQ and Links. 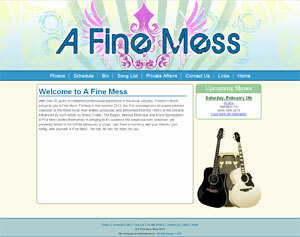 A Fine Mess is an Acoustic Cover band from Trenton, NJ, with over 30 years of combined professional experience in the music industry. A Fine Mess prides themselves in bringing to its audience the simple passion, precision, yet perplexity linked to the infinite pleasures of music. This web site was designed and built to showcase the band's music and give their fans a one-stop shop. The site includes weekly photos from shows, tour dates and links to all their external pages including Facebook. 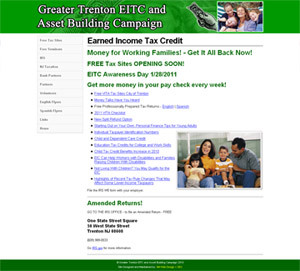 The Earned Income Tax Credit or the EITC is a refundable federal income tax credit for low to moderate income working individuals and families. 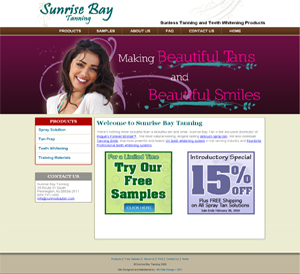 Sunrise Bay Tanning the creator of Rogue's Forever Bronze and distributor of Tanning Smile and Pearlbrite Professional teeth whitening systems, was interested in connecting with new partners and attracting a national client base. The company approached 4M Web Design for an online solution they could market and sell their sunless tanning and teeth whitening products to local and national distributors. 4M Web Design created a website site that reflects the same high quality and attention to excellence as the Pennington, NJ salon. The clean and professional website offers a crisp color scheme, user-friendly navigation and is seamlessly integrated with PayPal for all shopping cart and check-out functionality. The left hand side navigation allows visitors clear-cut access to all of the products for sale. Inside the site we developed a Free Samples page and contact form. Other internal pages include: About Us and FAQ's. 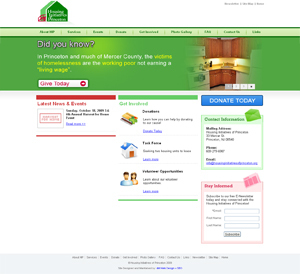 In need of a new web site, Princeton-based Housing Initiatives of Princeton (HIP) turns to 4M Web Design for an online solution to raise awareness of homelessness and the unmet need for affordable and low-income housing in Princeton. I know the name may fool you, I did not go into construction, I can barely swing a hammer. This site was for my Uncle Lee. I can tell you from the photoshoot that his work is top-notch (see photos in the “Project Gallery” area of the site). Krav Maga Israeli is a private firm providing global counter-terror and security consulting, training, and risk management to government organizations and the private sector. KMI personnel are highly specialized and uniquely qualified in Israeli defensive tactics, security, and counter-terror applications and operations. 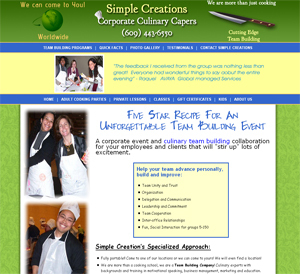 Simple Creations School of Cooking is a corporate event and culinary team building collaboration. Co-owners, Mary Ann Romano and Teresa V. Kelly have professional and diverse backgrounds and training in motivational speaking, corporate management, food science, marketing, education and culinary arts. Chrono Therapeutics Inc. (CTI) is a specialty pharmaceutical company focused on the development, manufacture and commercialization of drug-products utilizing our proprietary formulations and transdermal drug delivery platform-ChronoDose™. 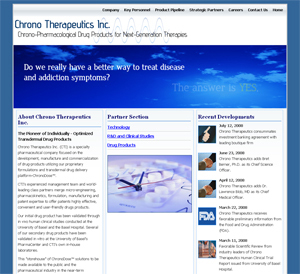 Chrono Therapeutics web site displays Company, Key Personnel, Product Pipeline, Strategic Partners and Career information. Future developments include developing a Partners Only section, where current partners can login using their unique logon id's and view Technology developments, R&D/Clinical Studies plus Drug Products. 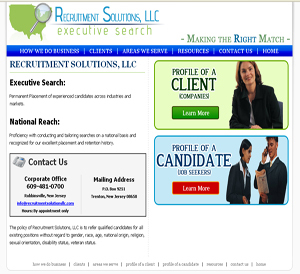 Recruitment Solutions, LLC is an Executive Search, National Reach and Permanent Placement business. We designed the Recruitment Solutions web site to inform the public of the numerous services offered as well as How we they business, Profiles of a typical client plus, Profile of Candidates. The Tracey C. Barnes Scholarship Fund was created by Jimmy Barnes in the beloved memory of his wife, Tracey C. Barnes, who passed away from Breast Cancer in 2006. The web site allows students to apply for the scholarship and features a photo galley from all past events. The Independent Music Roundtable is a music business blog which supplies useful information to independent bands, artists and record labels. 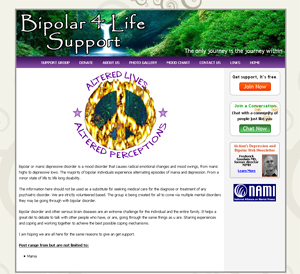 The blog design is clean and stylish and is managed using wordpress. The blog uses various plugins including; SEO Packs, RSS feeds, contact forms, Share features, Google Analytics and Subscription options. We designed The Action Duo's web site to showcase their amazing talent and "Not Karaoke" mentality! We created two side graphics which link to the band's mailing list and MySpace page's. 4M Web Design maintains, manages and promotes The Action Duo's web site on a weekly basis and their newsletter on a monthly basis. Hair It Is Salon is consistent in their quality of service and responsive, understanding and considerate of to all of their guests needs. 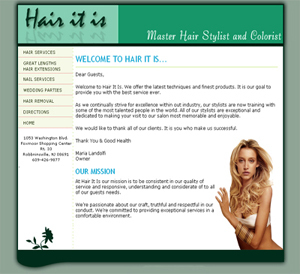 We designed Hair it Is' web site to inform the public of the numerous services offered as well as showcase their partnership with Great Length's hair extensions. For over 20 years, American Trolley Tours has been providing professional, safe and comfortable transportation for Historic and Specialty Tour as well as Private Custom Tours, Corporate Shuttle Services, Weddings, Proms, Holiday Excursions and Bar Mitzvahs. 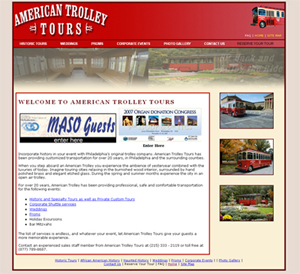 We build a user friendly web site that showcased American Trolley's numerous Trolley Tours through out the City of Philadelphia. We continue to manage and expand the site to better serve customers from around the world who visit Philadelphia. The Arc of Mercer is an association for people with mental retardation and developmental disabilities. We are committed to empowering the lives of all people with mental retardation or developmental disability (known collectively as cognitive disability) through opportunities to set and realize their goals. 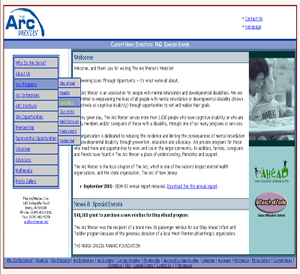 We re-designed the Arc of Mercer's web site to be user friendly and meet ADA requirements. We added a drop down navigation system in order to accommodate the extensive amount of internal pages, Optimized all Pictures and Graphics and logically re-arrange the site structure. In addition to re-designing the Arc of Mercer's web site, we maintain and manage the ARC's Touch of Taste an E-Commerce web site where visitors can order a variety of Gift baskets. Located in Hamilton, NJ the Buffstone’s Bar and Restaurant has been a fixture in the Township since 1932. Family owned and operated by the Chiacchio family they feature live entertainment almost every night of the week and have an extensive menu featuring some of the biggest burgers in town. We built a web site that showcases their extensive Menu, Live Entertainment and all the bands that play at the Buffstone's. 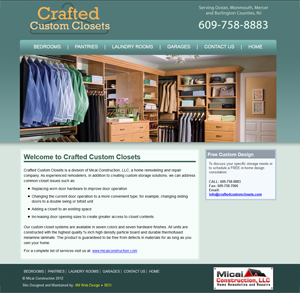 Keeping their motto "We Love Our Customers" as a theme throughout the entire web site. 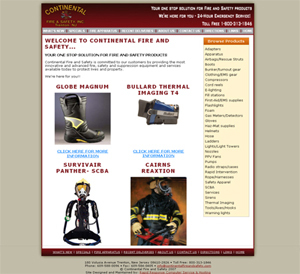 The web site showcases the many fire and safety products offered by Continental Fire and Safety. Future plans for the web site include; adding an e-commerce solution for customers to order products directly from their newly re-designed web site. Sometimes referred to as “the E Street Band for Generation X” The Cryptkeeper Five aren't too keen on being labeled, and that's understandable because their sound defies classification. Loud? Yeah. Groovin'? Hell, yeah. With a blend of 50’s Rock n Roll melodies, the raw intensity of 70’s Punk Rock and the twang of Early Country coming straight out of Jersey. We built a web site that allows members to sign up online, download flyers and other promotional tools, e-mail profiles for the members’ page, view and participate in current contests, view pictures of other members work, and read a bi-monthly newsletter written by the band. We also added a FAQ section of common Street Team questions and also designed a Database which collects and tracks member progress. Groove Pocket is a groove-oriented rock band that transcends all age groups and musical tastes. GP is one of the hardest driving bands on the east coast. They are sponsored nationally by Dirtbag Clothing; and have arrived in the club's radar over the past few years. This web site was designed and built to showcase the band's music and give their fans a one-stop shop for all thing's Groove Pocket. 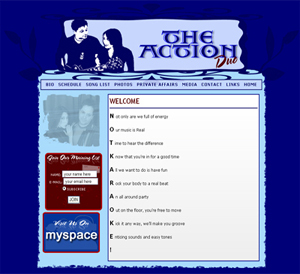 The site includes weekly photos from shows, tour dates and links to all their external pages including MySpace and CD Baby. 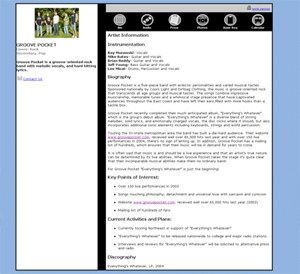 After we designed Groove Pocket's web site they asked us to design their EPK (Electronic Press Kit). Their EPK allows visitors to read the band's biography and press clips, download band photos, and listen to audio tracks. Additionally, the EPK is linked to the band's individual homepage, tour dates, related sites and contact information. We developed a visually appealing site that is simple and functional in order to accommodate the extensive amount of information being conveyed. The web site shows the Foundations Mission, Your Right to Know, Child Safety Info, Programs, News and Events, Megan's Law Coast to Coast, Pink Ribbon Page, Publications, Donate, Email, and Get Involved. 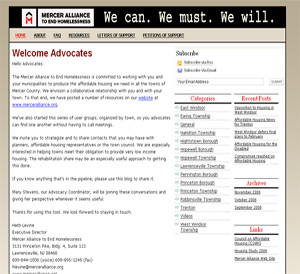 The Mercer Alliance to End Homelessness is a collaboration of government agencies, non-profit organizations, elected officials, corporations, congregations, community groups, and individuals who have banded together to create comprehensive strategies to end homelessness in our community within ten years. 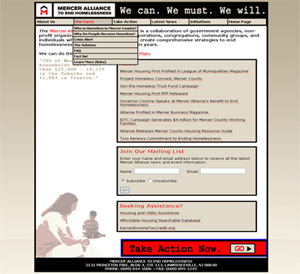 We re-designed the Mercer Alliance to End Homelessness' web site by adding background colors, a drop down navigation system in order to accommodate the extensive amount of internal pages, Optimized all Pictures and Graphics and logically re-arranged the site structure. 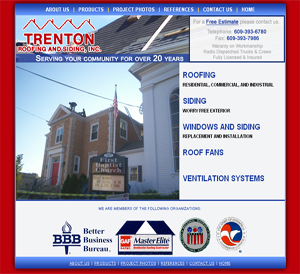 We also design and maintain their E-Mail Newsletter which is sent out on a Bi-Monthly basis. 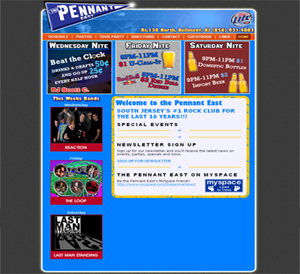 The Pennant East is South Jersey's #1 Rock Club for the last 16 Years. We re-designed the Pennant East's by adding Monthly Schedules, Photos from Events, Bachelor and Bachelorette Parts, Birthdays, Business, Reunions, Fund Raisers and Anniversary Party Information with contact information, created a Guestbook and created a MySpace profile for the club. Porkpie Publicity is a full service Promotions and Public Relations firm that can guide a client through all aspects of Guerilla Marketing, Tour Marketing, Street Team Promotions, and Radio Promotion. Porkpie Publicity has surrounded itself with qualified graphic artists, web developers, photographers, and administrative staff. We designed Porkpie Publicity's web site to showcase all of the services they offer to their client's. We created a drop down navigation menu for easy of use and also created a MySpace profile. We also designed and maintain an E-Mail Newsletter which is sent out on a monthly basis. The Rockets are a 6 Piece, High Energy Band from Northeast Philadelphia. They play everything from Linkin Park to Build me up Butter cup and everything in between. They like to talk and party with all of our friends at our shows and meet new ones!!!! The Rockets are synonymous with the words "Party Band." For well over a decade they have dominated the East Coast club scene. 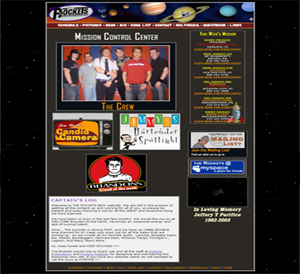 We designed The Rockets web site to showcase the bands amazing talent and promote bookings. There is a Multimedia section where the band uploads photos and videos from recent shows. The Starfield Entertainment Network is headed by Billy Stott. Billy has performed and managed bands for well over twenty years. He directs the acts to fulfilling clients' needs. There is one simple goal, the audience having fun. Each act involves the audience to participate, dance, sing, etc. The music and theatrical presentation is highly polished. The Starfield Entertainment Network's web site is designed to showcase the amazing talent they represent. The site features individual web sites for all the bands that include; Photos, Biography's, Song Lists, Press Clipping, MP3's and Videos.